Often the small children who attend kindergarten, asking my mom to cook the same food, what they are fed in kindergarten. Usually it's cottage cheese and potato casserole, scrambled eggs, burgers and, of course, soup. Adults also do not refuse to taste these dishes to return to their carefree childhood. – sour cream for filing. First in cold water immerse the washed meat in one piece without cutting. When the water boils, carefully remove the formed foam, reduce heat, add salt, spices (Lavrushka and allspice) and purified onion bulb. The broth with spices should be cooked on low heat for half an hour. Then the broth must strain to remove the spices and onion), and again to return to the fire with the meat, topping up water up to two liters of the original. When the broth boils, add the whole peeled beets. While the beetroot is cooked (40 minutes), you need to peel potatoes, carrots, garlic, wash the greens and place on napkin to dry. Two medium potatoes cut into finely. One small it remains intact. Grate carrot coarsely grated and a little Podesite in a frying pan, adding a spoon of sunflower oil. Half an hour after beginning to boil beets, soup, omit one small potato in its entirety. After 40 minutes, remove the beets, cool and grate it coarsely on a grater. Saute it a little in the pan with the carrots. Half the bunch of dill wrap with a thread, so he is not broke. The rest of the herbs finely chop. Remove from the broth meat. Dip in broth sliced potatoes, steamed beets and carrots (sprinkled with vinegar or lemon juice) and dill. Simmer for 20 minutes. Then remove the dill and a potato. Mash it with a potato masher or spoon and again put it into a soup. Finely chop the meat, and also put in the soup. Allow it to boil. Turn off the heat. Add to the pan the finely chopped herbs and crushed garlic. If necessary, dosolit. Stir, close the lid for two minutes, and then remove the cover and do not cover until the soup has cooled, to maintain a rich color. 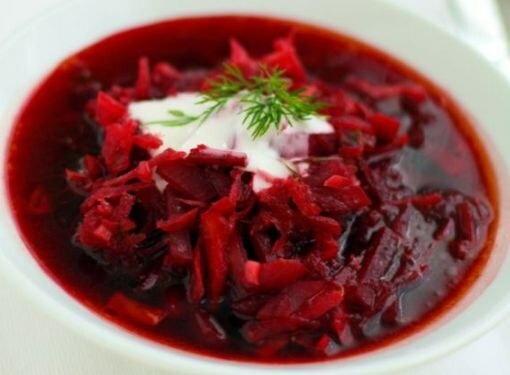 Borsch is served with sour cream. After standing overnight in refrigerator, reheated the next day he even tastier than freshly brewed.